Unit : Aerial Tower 61 "High Expectations"
Aerial Tower 61 is a Mid-Mount 100' aerial tower, with 2 master stream devices. Powered by a 500HP Cummins and Allison Automatic, Aerial Tower 61 is equipped with a 1500 gpm Hale pump, 150 gal of water, (2) 200’ 1 ¾” cross lays, a 200’ 2 ½” cross lay, 500’ 5” LDH, 143’ of ground ladders and 9500 watts of scene lighting and all other NFPA required equipment. 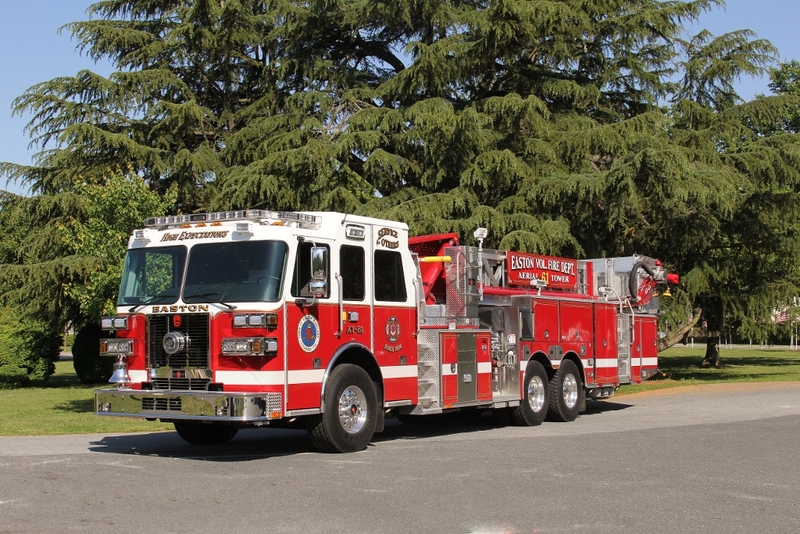 Nicknamed “High Expectations”, AT-61 is 46’ 6” long on a 236” wheelbase Sutphen chassis, and was built to fit within the height constraints of the existing firehouse and measures a short 10’ 3” tall. The bell on the truck carries on and EVFD tradition, as it has served on every aerial truck owned by the department since the 1940’s. Gold Leaf Lettering and Vinyl work performed by Danz Lettering, Aerial Tower 61 was sold by John Lawver, Lawver Fire Apparatus , Gettysburg, PA.
AT-61 is housed at the Headquarters Station.